Full Name: Grace Arden Adams-Square. Full Title: Assistant Professor of Political Science. Teaches American Government, Introduction to Political Science, Public Administration, Education Policy, Congress, State and Local Government, Presidents, Urban/Metro Studies, Women Studies, and Emergency Management. Degrees: Bachelor’s and master’s in political science from Indiana University and West Virginia University; master’s in education from University of Toledo; doctorate work in political science and paralegal studies (certified) from Roosevelt University-Chicago, Illinois. 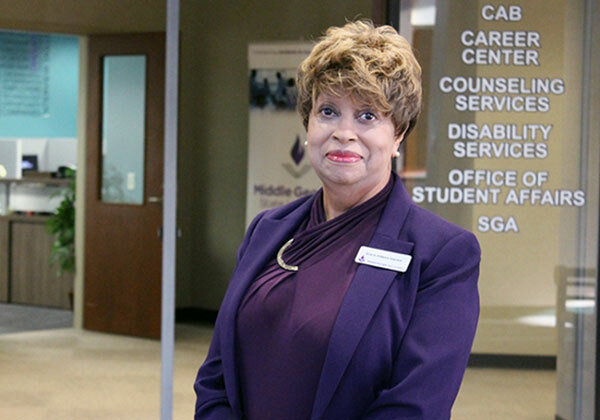 Describe your service to Middle Georgia State University and the community. “Reaching out to our student veterans has been an ongoing commitment of mine since 2011. Initially, my service began as recognition to student veterans on Veterans Day. My efforts became further nuanced as more veterans were returning to the classroom while I was teaching on the Dublin Campus. The changing landscape made me realize that veterans needed effective support. Through my interaction with student veterans, I learned they experience numerous challenges while transitioning from military life to civilian life. Subsequently, I formed a partnership with the VA Hospital in Dublin. As time went on, I was tasked with the responsibility to teach ‘Perspectives on Diversity’ classes. Although the course material does not instruct faculty about student veterans, I was able to discern that student veterans are a distinct group with distinct challenges. I then created an avenue for particular student veterans to explore their military experiences. One of my classes was comprised of many student veterans, so I asked them if they would be willing to share what branch of the service they served in, how long they served, whether or not they served in combat, and why they chose MGA. They all agreed. My students and I had the most illuminating interaction as we listened to veterans who served in Vietnam, Desert Storm I and II, and in Afghanistan. I believe I helped them realize that MGA was mindful and supportive of student veterans. “Eventually, I was asked to teach American Government on the Cochran Campus. I took with me that same commitment to student veterans. With the help of some fantastic faculty and staff on that campus, I have been able to advance strong programming during Veterans Day to honor our veterans. "Students would be surprised to learn that I have set a goal to visit all 50 states. I have 13 more to go."